I have long been looking for when Donna made the shift from being in the “Chin Chin” production to being in the “California Bathing Beauties.” The last “Chin Chin” production that I know of was on May 21, 1920 in Geneva, NY at the – Smith Opera House. I knew that she appeared in the “California Bathing Beauties” at the Plaza Theater in Bridgeport, CT on December, 30, 1920. That is seven months and I could not believe that she went that long without other performances. I had poked around looking for later “Chin Chin” productions but hadn’t much luck finding anything. I thought I’d see if I could find other “California Bathing Beauties” productions in 1920. I went to one of my favorite newspaper sites, Elephind.Com. Elephind is particularly good because they not only search the Library of Congress’ six million items, but also millions of additional items including the California Digital Newspaper Collection, Pennsylvania State University, and many more. My search criteria was narrow but simple: Search all Text for “California Bathing Beauties” and the year of “1920.” The results, 6 matches in the (Philadelphia) Evening Public Ledger, two of which were in August 1920. I was then directed to the Library of Congress site where I could broaden my search a little bit. I searched just the Evening Public Ledger for “Metropolitan AND Bathing” and found 26 instances. A few of them weren’t what I was looking for, but the vast majority were helpful. I like to use a narrow search criterion, find something relevant, and then broaden the search in a tightly defined environment. 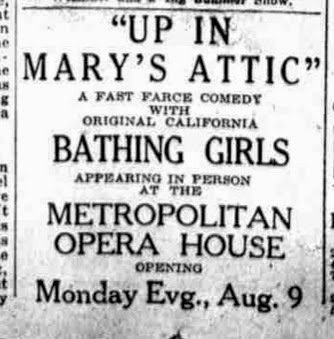 Advertising began on August 2nd with a small ad that indicated “Up in Mary’s Attic” was opening August 9. Appearing with the silent movie was the “Original California Bathing Girls” who were to be in person. This pairing showed a great match. “Up in Mary’s Attic” was the story of a young woman who would inherit a fortune if she remained single until she was twenty-one. However, she actually not only married her gym teacher she had a child and hid the child from the conniving son of the principal in the attic of her dormitory. One of the scenes in the movie includes Mary, played by Eva Novak, in a bathing suit. Eva began show business as a Mack Sennett Bathing Beauty before her first movie in 1917. It is very likely that Donna knew Eva as they were both Mack Sennett bathing beauties about 1915. I wonder how she felt following the film star as a vaudeville show. I wonder even more how Donna felt as she saw Eva’s career skyrocket as Tom Mix’s love interest in 10 of his western movies and 130 credits, from 1917 to 1966, to her career. Advertising on August 3rd let the readers know that there were three showings daily. A matinee at 2:30 that only cost 25¢ and evening shows at 7:00 and 9:00 PM with 25¢ and 50¢ seats. Advertising on the 4th and 5th continued the same information. 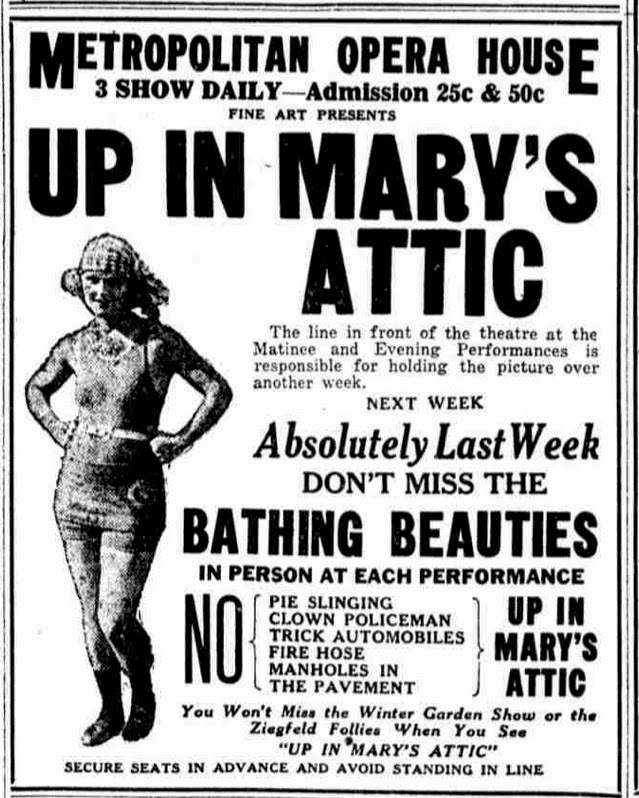 “Up in Mary’s Attic” is said to be free from slapstick and grotesque antics. The picture tells a comic story of a romance in a boarding school. The Charming Eva Novak will be seen in the leading feminine role and Harry Gribbon in that of the instructor who marries in secret. While While the “Original California Bathing Girls” was at the Metropolitan, another show, “Rube Bernstein’s Bathing Beauties,” a burlesque show, was competing playing at the Bijou. 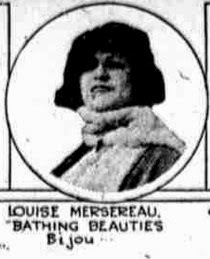 The paper on the 7th included a photo of Louise Mersereau, one of the “Bathing Beauties” at the Bijou. Clearly to compete for theatergoers, the Metropolitan Opera House had two promotions. First, “Six Navy aeroplanes, obtained through the courtesy of Lt. Com. C. Gulbranson, will fly over the city Monday and Tuesday and distribute 100 passes.” I wonder of Donna had anything to do with promoting that idea. Remember, she distributed passes for Birth of a Nation from an aeroplane in 1915. Donna become the headliner for the show. the 16th there was a contest to enter the movies. A chance of a life-time to be starred in a Fine Arts Production. won the contest. It would be interesting to find out. Theater: Metropolitan Opera House (Philadelphia). [Pa.]), 03 Aug. 1920. Chronicling America: Historic American Newspapers. Lib. The Knight household in 1914 consisted of Ida and her husband Harvey. Ida’s daughter from a previous marriage(? ), Madonna (aka Donna), was in California working in the movies and working as a Mack Sennett bathing beauty. Ida’s father, Franklin, had died previously. 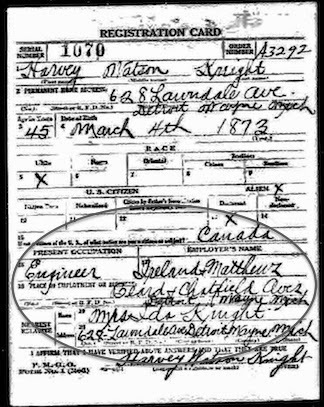 Harvey’s parents are believed to still be in Chatham, Kent, Ontario, Canada. (There is no evidence that I have found that puts them anywhere else.) 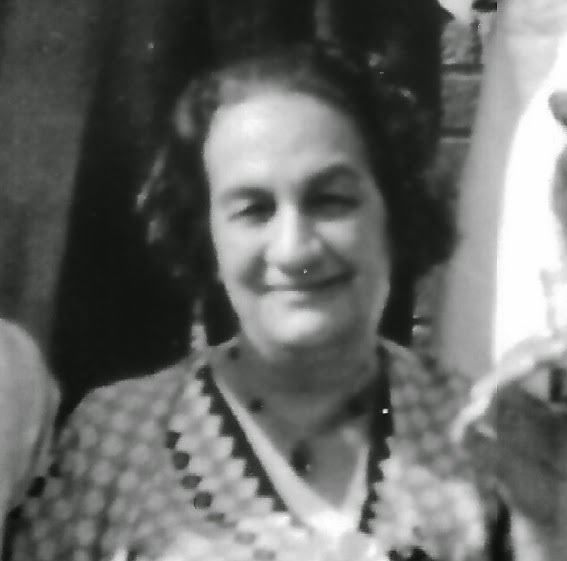 Ida’s Mother, Sarah H Blackhurst (Barber) had been living at 1419 Clay Avenue in 1910 with Ida, Madonna, and “Boarder” Harvey Knight. According to the 1920 Census, Sarah was living in Manhattan with Madonna who was on the road in a Vaudeville act. So in 1914, it is possible that Sarah was living eight miles away from Ida on Clay Ave or possibly living with Ida and Harvey on Lawndale. Ida’s sister, Eva Louisa Barber Goff, was probably living with her husband and daughter, about three and a half miles away on 15th Street. It doesn’t appear that the 40-year-old Ida worked outside of the home and is presumed to have been a housewife. Her husband, Harvey, was an engineer. In 1914 he probably worked for Ireland Matthews at Beard & Chatfield Aves., which is about 1 mile away. (He was working there in 1917 for certain – See WWI Draft Registration.) Today, that site is the location of the Roberto Clemente Academy a Pre-K to 5th grade which was built in 2001. Of course the international news of the day was about the war in Europe. On this date, 23 December 1914, was the beginning of the now famous “Christmas Truce.” A German soldier, Karl Aldag, reported that both sides had been heard singing hymns in the trenches. German troops coming into the lines bring Christmas trees. Some men begin to place them on the parapets of the fire trenches. Local truce on the front of 23rd Brigade. Nationally, the country was still talking about the Boston Braves. A newspaper article in the New York Tribune on December 20th described how mid-season trades made by Boston Braves manager George Stallings helped the team move from last place to first place. According to Wikipedia, the 1914 Braves are the only team to have been in last place on the 4th of July and go on to win the pennant. The Braves continued on to be the first team to sweep the modern World Series. In 1953 the Boston Braves moved to Milwaukee. “Detroit Front” by W. G. MacFarlane – Postcard. W.G. MacFarlane, Publisher, Buffalo, N.Y. Toronto. The Detroit Tigers finished 4th in the American League in 1914; however, their famous outfielder, Tyrus Raymond “Ty” Cobb, took the batting title with a .368 season. Movie goers were anticipating the release of Mary Pickford’s “Cinderella” The Campus Martius Park was opened. See Photo on right. Also in 1914 Detroit the “inter urban” cars of the Detroit, Almont, Northern R. R., which linked Detroit with Almont, about 50 miles to the north began service. by Wystan from Ann Arbor. Licensed under CC BY 2.0 via Wikimedia Commons. Image: 77.0; FHL microfilm: 2340796.